Teaching the next generation how to enjoy the slopes. 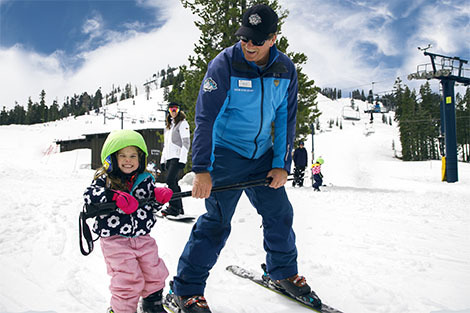 Whether it’s your child's first time on snow, or you’re interested in their skiing or riding skills, Sugar Bowl’s professional ski and snowboard instructors will help them reach along the way. Lesson programs focus on skill-building and fun to ensure children's success while safely enjoying winter sports. Private and group lessons are available for all ability levels. We specialize in children's ski, provided by quality professional instructors, with additional focus on safety, fun and learning. Children's lessons are offered at both Judah and Village base areas. Sugar Bowl currently only offers ski lessons for ages 4-5. All day lesson package starts at 9:45am and requires a reservation at least 24 hours in advance. This package includes a full day lesson, rental equipment, full mountain lift ticket, and lunch. Sign-up for an Early Drop Off for only an additional $35 if you are looking to hit the slopes when the lifts start spinning at 9am. Half day lesson package is offered at 9:45am or 1:00pm and also requires reservations at least 24 hours in advance. This package includes a half-day lesson, rental equipment, and full mountain lift ticket. Guaranteed class size of 3 students per instructor.